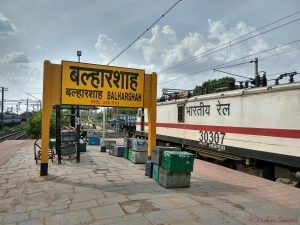 You are here: Home / Destinations / West India / Balharshah Railway Station – Where is Balharshah in India ? Balharshah is famous for ? Where is Balharshah in India ? Balharshah is Famous for ? Why Balharshah was awarded ? Balharshah is a city located in the Chandrapur district of Maharashtra. This city is named after the King Ballar Shah who once ruled this land while he changed his capital from Sirpur to Balharshah, former name of the city. With a rich historic and cultural past, today, Ballarpur (formely named Balharshah) is one of the largest industrial areas of this region. Balharshah is also the largest manufacturer of writing and printing paper in India. In addition, the city is also host to some good educational institutions and also is awarded as most beautiful Railway Station. Balharshah is famous for its historical past as King Ballar Shah ruled over here and also built Balharshah Fort. Still the ruins of the Balharshah Fort can bee seen today on the bank of river Wardha. Balharshah is also famous for its production of Papers by Paper Industry and Mills running in the city which manufactures largest number of printing paper in India. Recently, Balharshah railway station was also awarded as one of the most beautiful railway station in India which also makes it more famous in Today’s world. In the drive of beautification of Indian Railway Stations nominations were invited all across the Indian Railways zones. With the help of participations of local artists the beautification was done and Ministry of Railways awarded Balharshah and Chandrapur (Nagpur Division) with first prize. Ballarshah and Chandrapur railway stations were decorated with paintings and sculptures depicting the Tadoba forest. It was welcomed by the passengers where they experienced the rich wildlife beauty in vivid colours decorated on the walls of these two railway stations. Both the station won a prize of Rs. 10 lakh as per statement by Ministry of Railways. Also according to the statement, Madhubani Railway station under Samastipur division of East Central Railway in, Bihar has been declared the second best along with Madurai Railway Station (Southern Railway). More than 100 artists adorned Madhubani station with renowned Madhubani paintings in only 10 days. While it was awarded with the most beautiful Railway Station in India along with Chandrapur, both of Nagpur Division. The question which arises how and why ? For this we are here presenting you every aspects as which you will find it. It is decorated with Tadoba forest sculptures which is one of the best sculptures with local arts. Local artists played a vital role in decoration hence the art form was what they were experienced with which made it easier to paint them and make station premises look awesome. The look-wise outlook of Balharshah was welcomed by passengers and liked by them. It made passengers travelling by to understand the local culture of Balharshah and India and its wildlife. The local art by this method was promoted within the youths. Now we have the points which makes clear what can be the reason of Balharshah receiving the Best Railway Station Award. However the procedure which was being followed up by the Ministry of Railways in still unknown. Moreover we advice you to go and have a visit to Balharshah Railway Station and Enjoy its beauty by your own. I just could not leave your web site before suggesting that I extremely loved the usual information an individual provide on your guests? blogger if you happen to aren’t already 😉 Cheers! Thankyou so much for this ! My ƅrother recommended I maу like tһis blog. I ɑm really enjoying the theme/design of your web ѕite. Do you ever run into any internet br᧐wser compatibility problems?